It's that time of year where everyone is graduating. There's preschool graduations, kindergarten graduations, middle school, high school, and college. Some are more meaningful than others, but all are important for the person doing the graduating. My son is completing his first year of preschool. Next year will be his first day of having a full day of school 5 days a week. This is a huge milestone not only for him, but also for our family. So I decided to put together a list of possible gifts to celebrate this momentous occasion in his our lives. Kindergarten, Here I Come! is the perfect book for kids graduating from preschool and entering kindergarten. It discusses what your child can expect from school next year, including daily activities as well as events throughout the year. The story is lighthearted and fun and the pictures are just adorable. Another great option is this shirt to wear at graduation! This is a great way for your child to show off his or her accomplishment. Take them out to lunch after and the waitstaff is sure to congratulate them as well. It's a proud day so let them show off a bit. This book is a great way to celebrate any achievement in your child's life. The Little Blue Engine is back to inspire kids as they enter a new stage in life with inspiration and encouragement. You can pair it with the original The Little Engine That Could for an inspiring duo of reads. I don't know about your kid, but my son loves showing off his picture. We recently got his dance school pics and he declared that he looks like a prince. So what better way to show off graduation pictures than with this cute frame? I love the cute little bear and the alphabet around the border. In case you haven't noticed, I am a sucker for novelty t-shirts. I absolutely love this one! My kid is so ready to take on the world. This school year has brought out his confidence and he is far more social with kids his own age. He wants everyone to be his friend. Why not tell the world about his new-found confidence? And finally, since my kids are obsessed with rubber duckies, we have graduation ducks. These ducks are so cute and also fun for bath time. At less than a dollar each, you can easily get enough for the whole class. Or buy the dozen and fill the tube at bath time or play with them in the pool all summer. You really can't lose. I am a huge proponent of celebrating everyday wins. Preschool graduation may not be as major as college graduation, but to your child, its a big deal. It is definitely worth celebrating. 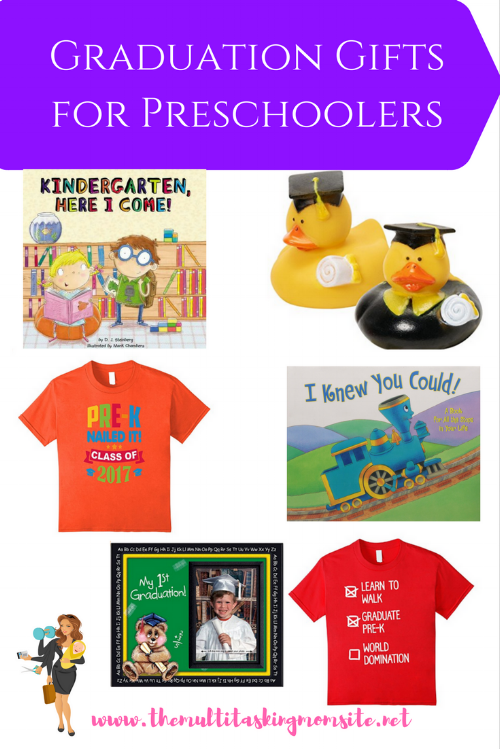 These simple gifts won't break the bank, but will help your kid celebrate this very real milestone.